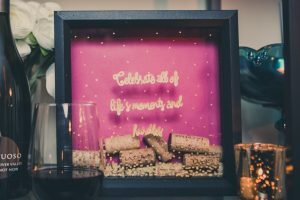 Would you want to keep a memorabilia of those good old drinking days you enjoyed with your pal, then decorating a shadow box with your upcycled wine corks may prove a fantastic idea! 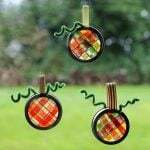 A myriad of interesting DIYs to follow will make your creative task a mere cakewalk. The black shadow box would look even more splendid when placed against a white background. 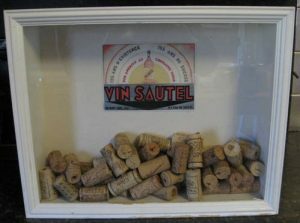 Color the corks in green and red if you are giving it as a Christmas gift. 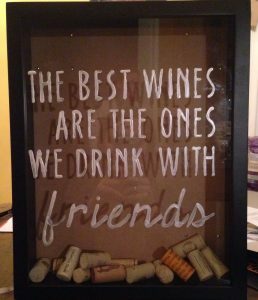 The painting on the shadow box gives it a personalized touch. 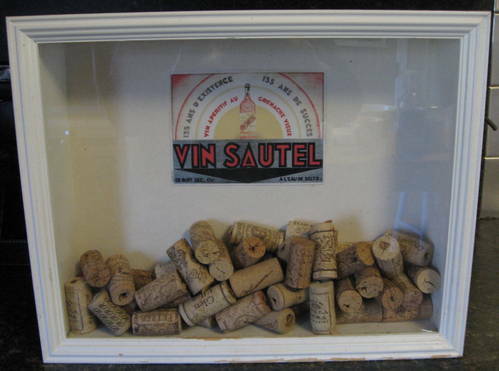 If your husband or beloved is obsessed with wine, then gift him a shadow box containing corks of his favorite wine. 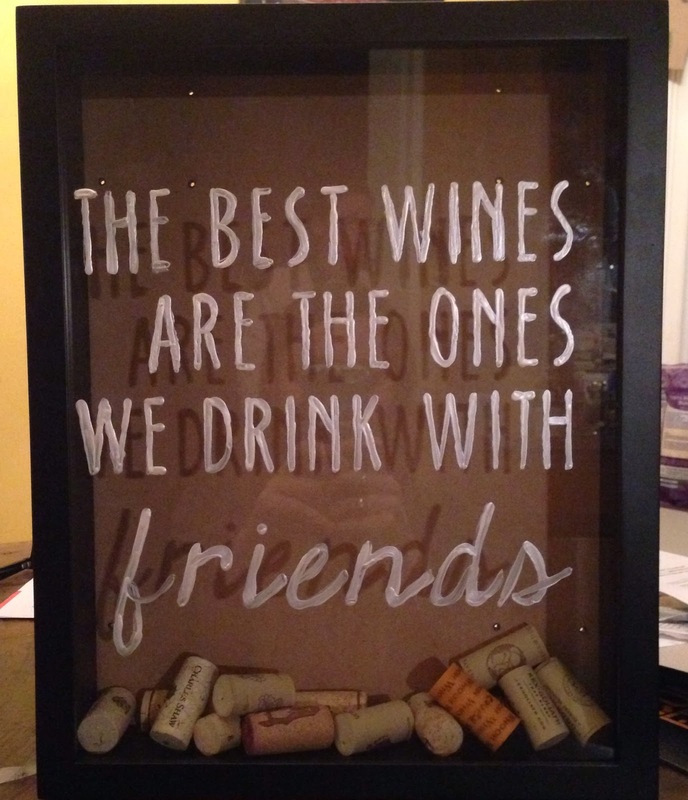 Write a thoughtful message in red paint to delight him to the fullest. 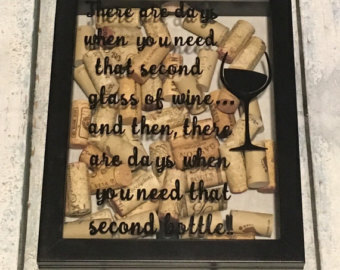 Following the same DIY pattern, this message would indeed be an interesting one. 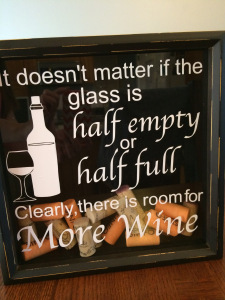 The wine glass sitting on top enhances its charm. 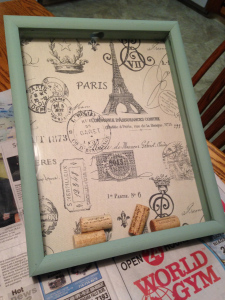 The burlap fabric adds to its rustic look. 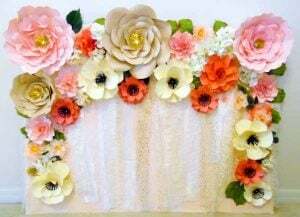 You can make it more gorgeous by adding glitters, sparkles or other embellishments on the burlap. 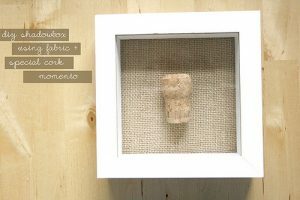 Glue a colored stone on the cork to make it look like a ring. Make your message as catchy as possible to heighten the fun element. 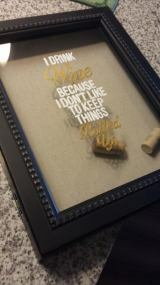 A beautiful memento to give as a gift of marriage to your nearest kin. 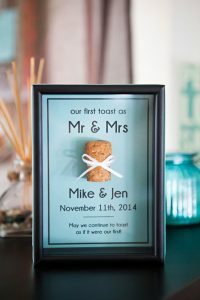 You can also paste small cutouts of the bride and groom and glue them on both sides of the cork to make it even more special. You can also create a curved design with the dots for an enticing effect. 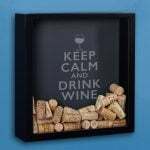 The “Keep calm and drink wine” message is indeed an apt one for people who have a close bonding with the bottle. Follow the engraving pattern in the tutorial and then implement it on the shadow box. The glass frame at the top gives it a chic look, making it convenient for you to stuff and take out your corks whenever needed. 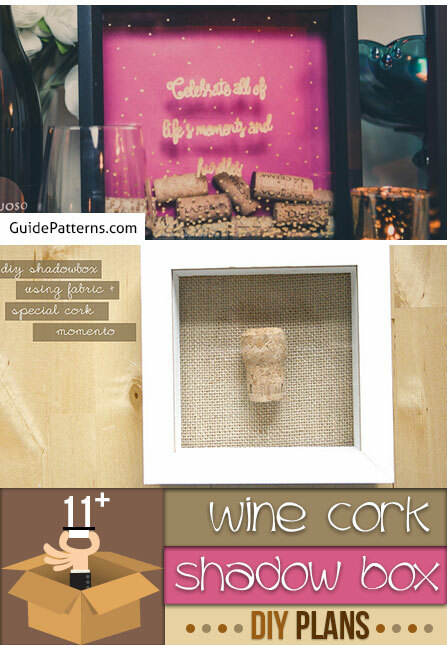 You can paint a portion of the corks and arrange it uniformly for a creative approach. 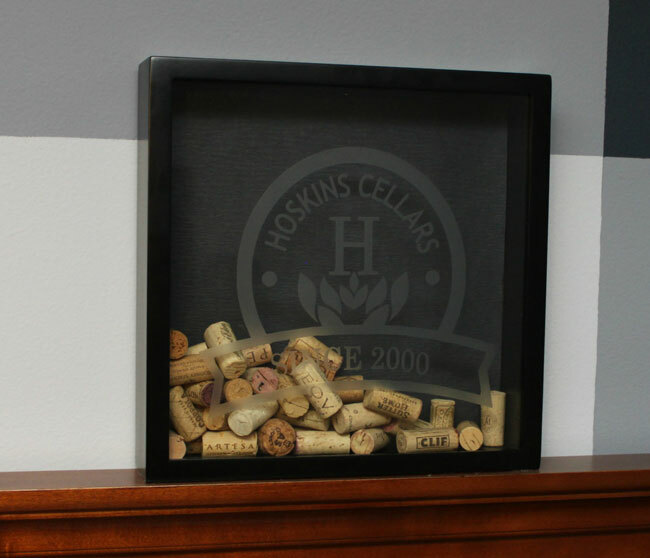 You can engrave your beloved’s name in one of the wine corks. 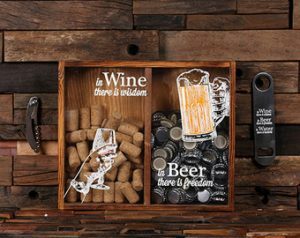 Another unique idea would be to get a shadow box with two compartments and place corks in one and beer caps in the other for a perfect combination. 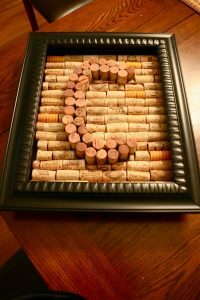 The ideal arrangement of the letter “C,” gives it a unique look. You can choose to paint the top part of the letter which is visible for an innovative appeal. 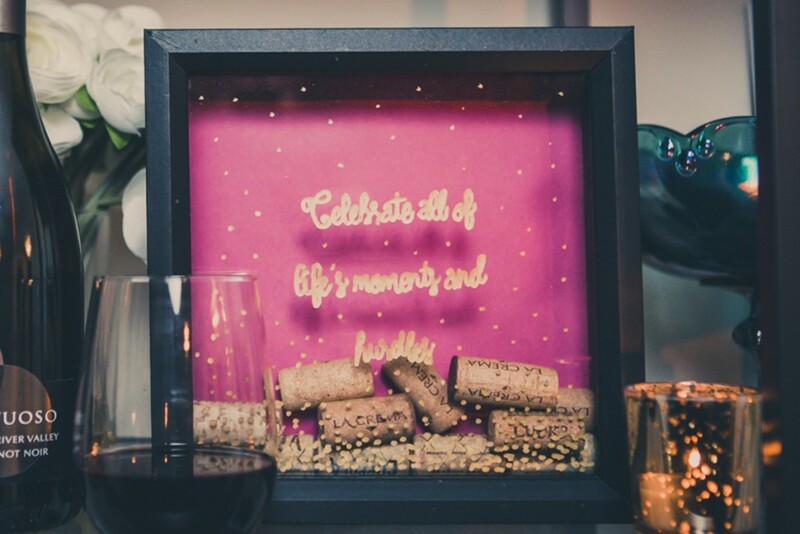 With an array of exciting designs at hand, get set to create stylish shadow boxes to store and collect your wine corks. Go for a kit rather than spending a tedious time in collecting the supplies to make your task an easy one.